Alessandro Cocciola designs and develops quantitative, mechanical trading strategies that utilize proprietary measurements to determine the market regime along with a scoring system for S&P equities. His flagship strategy Carma Stocks is a mean reversion swing trading strategy that filters for oversold and overbought stocks. The strategy trades only highly liquid stocks, both long and short. In Episode 6 of Top Trader Radio, Alessandro and host Charley Wright talk about the investment approach behind Carma Stocks, the importance of matching trading methods to your personality, lessons learned about liquidity from the perils of 2008, and the characteristics that have lead to Alessandro’s success as a portfolio manager. Trading and portfolio management are my passions and my job. I find myself very fortunate that the two things coincide. Alessandro has 11 years of experience in the financial markets. He is the Principal Managing Partner of Carma Advisory, a SEC Registered Investment Advisor firm. He specializes in mechanical trading and portfolio management with a focus on long/short equity strategies. 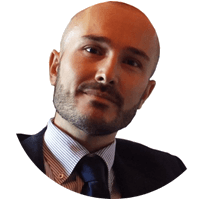 Alessandro is graduate of Economics and Banking at the University of Macerata (Italy) and has gained significant experience in leading Italian asset management companies as a Portfolio Manager and as a Risk Manager.